You should also watch the film Vertical Limit. That is very essential to a person's climbing knowledge: particularly their knowledge of nitroglycerin assisted ascents. I believe that film also is essential to learning how to jump from glacier to glacier and how to self arrest during free-fall. With that said, "Get the Dex!" 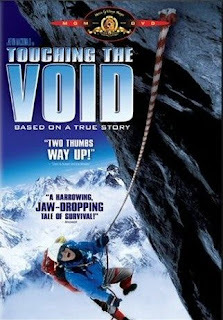 Finally got around to watching Touching the Void thanks to this post. However, I found that Vertical Limit definitely portrays more realistic situations and how to properly handle them. I think you're right. The opening scene of Vertical Limit is by far the most eye opening. I was never aware of how cams walk while evenly waited until I saw it.